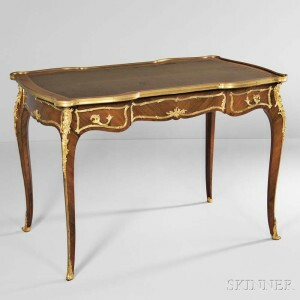 Skinner Celebrates the New Year with Two-Day Auction of European Furniture & Decorative Arts, Fine Silver, and Ceramics | Skinner Inc.
Iconic names in design and workmanship including Tiffany, Louis Vuitton, Faberge, and Wedgwood are prominently represented. 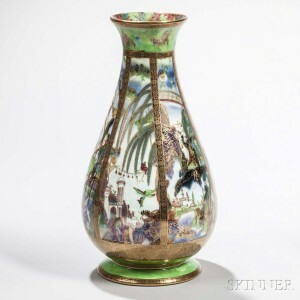 There is also a broad selection of unusual items from places across the globe, such as (Lot 199, estimated between $10,000-15,000), a Neo-classical Polish Silver Tureen and Stand, and (Lot 598, $400-600) an elaborately carved Anglo-Indian Sideboard. In ceramics, the main category is Wedgwood, of which there are large groups by this much loved, widely collected maker. Two pillar vases bracket 100 years of Wedgwood artistry, an Encaustic-decorated Black Basalt Vase, England, early 19th century (Lot 12, $2,500-3,500), and a Fairyland Lustre Vase, England, c. 1925 (Lot 90, $2,000-4,000). Additional Wedgwood offerings consist of a large number of black basalt pieces, jasperware in a wide range of colors including several tricolor objects, and fine examples of mid-century modern Wedgwood by noted designers Norman Wilson and Keith Murray. The silver category includes several spectacular objects. Stephanie Opolski, Specialist in European Furniture and Decorative Arts and Fine Silver, points to an imposing Tiffany Centerpiece, circa 1872 (Lot 252, $100,000-150,000). It is attributed to James H. Whitehouse, one of Tiffany & Co.’s earliest and most well-respected designers and creator of some of that fabled company’s finest presentation silver. At 48 inches long, the elaborate creation is noteworthy for its size as well the artistry of conception and workmanship. Another exceptional piece is a Russian Silver and Cloisonné Enamel Kovsh, circa 1900 (Lot 218, $8,000-12,000). These traditional forms were originally utilitarian drinking vessels, often made of wood. By the 16th century, elaborately decorated examples like this were wealthy owners’ treasures and gifts to important people to mark significant occasions. There is also a wide variety of British silver in forms ranging from tableware to frames for miniatures, and American examples from prominent names including Kirk, Bigelow Kennard & Co., Gorham, and Wood & Hughes, amongst others. Some additional highlights include a German Sleigh-form Centerpiece (Lot 206, $8000-12000), a Pair of George Shiebler Art Nouveau Candlesticks (Lot 288, $8000-12000), an Early Irish Silver Coffeepot by John Hamilton (Lot 129, $3000-5000), and a Nine-piece Coin Silver Tea Service from Philadelphia c. 1900 (Lot 230, $5000-7000). paw feet on casters (Lot 611, $1,200-1,800) and an imposing 69-inch high Louis XV-style Trumeau Mirror with neo-classical painted and carved decoration (Lot 431, $800-1,200). Other furniture offerings include an Edwardian Three-piece Salon Suite with sinuous art nouveau lines (Lot 676, $600-800) and a Renaissance Revival Walnut Mirror, over 7 feet tall, highlighted with ebonizing and gilding, and further distinguished with bearlike and foxlike carved figureheads (Lot 521, $800-1,200). Every Skinner auction contains surprises. In this case it comes in the form of an unusually large array of vintage luggage including seven pieces are from the legendary French malletier, Louis Vuitton. His company was the first to manufacture a light-weight air-tight trunk, flat-topped and therefore able to be stacked for storage or transport. Over 160 years later, Vuitton remains the most popular maker of fine luggage. A range of sizes and prices from the early 20th century are represented. Lot 542 ($4,000-6,000) is an imposing upright wardrobe trunk with six graduated drawers and several hanging dividers, and for those who travel light, Lot 545 ($600-800) is a roomy canvas steamer bag with leather base. 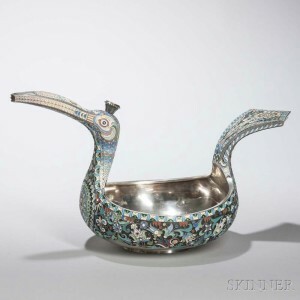 Stuart Slavid, Director of Fine Ceramics, Fine Silver, and European Furniture and Decorative Arts, notes that this auction includes numerous fine bronze pieces. 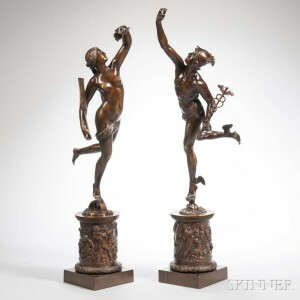 Among the notable lots are, a Franz Bergman Cold-painted Bronze Lamp depicting a merchant with Egyptian-style wares (Lot 381, $5,000-7,000), Grand Tour Sculptures of Mercury and Fortuna (Lot 411, $5000-7000), and Sixteen Cold-painted Bronze Figures, some mounted onexotic animals and others engaged in prayer, at work, or at play (Lot 461, $5,000-7,000). Another standout piece in this category is an Empire-style Gilt-bronze and Marble Surtout de Table (Lot 392, $6,000-8,000). Stuart Slavid called this piece “eye-popping” with its combination of colorful materials and Egyptian revival elements. Also noteworthy is a grouping of early 20th century Royal Bonn porcelain including six Ansonia mantel clocks each estimated $1000-1500. The collection in its entirety includes an example of each of the colors produced in this form by Franz Anton Mehlem’s pottery in Bonn, Germany. Auction previews are free and open to the public and held in Boston on Wednesday, January 11 from 12-7PM and Thursday, January 12 from 12-8PM, with the Session I preview ending at 4PM. The print catalog is available for purchase from the Subscriptions Department at subscriptions@skinnerinc.com. Prices realized will be available at www.skinnerinc.com during and after the sale. The Skinner website enables users to view all lots in the auction, leave bids, and bid live, in real-time through SkinnerLive! This entry was posted in Blog, News and tagged 17th century furniture, 18th century furniture, 19th century furniture, 19th century marble sculpture, American silver, black basalt, boston, bronze, bronze sculpture, Edwardian furniture, English silver, european clocks, european furniture, Faberge, fairyland lustre, fine ceramics, Fine Silver, Franz Bergman, jasperware, Keith Murray, Kovsh, Louis Vuitton, Louis Vuitton trunks, mantel clocks, Norma Wilson, portrait busts, renaissance revival, Royal Bonn porcelain, russian silver, silver centerpiece, skinner, skinner auctions, Tiffany & Co., Viennese table clocks, vintage luggage, wedgwood by Skinner. Bookmark the permalink.